Numismaster reports that CFTC Gets Facts of Bullion Manipulation. In November 2009, Andrew Maguire, a former Goldman Sachs silver trader in that firm's London office, had contacted the CFTC Enforcement Division to report the illegal manipulation of the silver market by traders at JPMorgan Chase. He described how the JPMorgan Chase silver traders bragged openly about their actions, including how they gave a signal to the market in advance so that other traders could make a profit during the price suppressions. Maguire asked to be invited to speak at the CFTC hearings this past Thursday. When he was not invited, he contacted Adrian Douglas, another director of GATA, on March 23 to supply this information to be made public at the CFTC hearings. Murphy filled Maguire's request in response to Chilton's question asking for specific instances of price manipulation. When I saw him Saturday, Murphy told me that the CFTC commissioners all went pale as he described exactly how the CFTC was provided this detailed information about silver price manipulation but had not yet done anything about it. During Harvey Organ's presentation, a question came up about whether large short positions on the London Bullion Market Exchange also reflected efforts to suppress gold and silver prices. Adrian Douglas was permitted to address the hearing on this issue, a subject he has studied extensively. Douglas pointed out that the huge volume of trading levels in the London market (averaging $22 billion per day) could not possibly be settled by delivery of physical metals. To this point, the commissioners asked Jeffrey Christian, one of the other speakers who runs CPM Group — one of the most respected precious metals consultancies, whether Douglas's contention that the London gold and silver markets could not be settled by delivery of physical metal for all the contracts. Christian rejects the concept that the gold and silver markets are manipulated, but he did confirm Douglas's analysis. After the hearing, GATA publicly released copies of Maguire's e-mails with the CFTC. Murphy also revealed that Maguire had recorded all of his telephone conversations with the CFTC without asking for their permission to do so. This is legal to do in Britain, but such recordings cannot legally be provided to other parties. GATA is currently working to ensure that these recorded conversations can be legally released to the public. This past Saturday, Murphy addressed a full room with his Numismatic Theatre presentation at the American Numismatic Association convention in Fort Worth. There, he shared much of the breaking information he provided to the CFTC commissioners. Little did we know at the time, but at about then Andrew Maguire's car, in which his wife and he were riding, was struck by a hit-and-run driver. Both Maguire a nd his wife were briefly hospitalized. The police eventually arrested the other driver. The Maguires may be considered more than lucky. There are other past would-be whistle blowers about the manipulation in gold and silver markets that died in unusual accidents before they were able to bring forth their evidence. Curiously, the live television broadcast of the CFTC hearing suffered a technical failure right as Murphy was set to begin his testimony. This was corrected right after Murphy was finished. At the same time, at least one live voice broadcast failed during Murphy's presentation. Coincidence? Now that this information about silver price manipulation and about the massive shortage of physical gold and silver on the London exchange is part of the official record, I expect huge fallout. Remember, after the five men were arrested for breaking into the Democratic headquarters in Watergate in June 1972, it took more than two years for President Nixon to resign. I don't think it will take anywhere near this long for last Thursday's revelations to blow back against the U.S. government and the U.S. dollar. Once the public realizes the extent of the manipulation, gold and silver prices are likely to skyrocket. The Huffington Post reports that It's Ponzimonium in the Gold Market. These hearings were supposed to be a non-event [which is why I didn't blog about them]. However, despite the media lock-down, the word is getting out. The CFTC even invited GATA's Bill Murphy and Adrian Douglas to make statements. Would you be surprised to learn that the cameras had a "technical malfunction" during Bill Murphy's statement, which magically righted itself immediately after he finished? The second part is the appearance of London metals trader and now whistleblower Andrew Maguire, who understands JP Morgan's manipulation scheme inside and out. Maguire understands the process so well that he was able to describe it to the CFTC's Bart Chilton on the phone in real time. As in: "in a few minutes, they are going to do this, and then they will do that." Listen to an extended interview with Maguire and GATA's Adrian Douglas on King World News here. Maguire has taken some personal risks to tell all this in public. In fact, almost immediately after his initial statements, he was run over by a car while walking down the street. The driver sped away, nearly running over some other pedestrians in his haste to escape. Fortunately, Maguire survived the hit-and-run "accident" with minor injuries. What a coincidence. For many years, people assumed that the London Bullion Market Association (LBMA), the world's largest gold market, was a simple bullion market. Cash for gold. However, just in the past few months, more people are realizing that there is actually very little gold within the LBMA system. There is nothing new about this. Morgan Stanley paid several million dollars in 2007 to settle claims that it had charged 22,000 clients for storage fees on silver bullion that didn't exist. PR Newswire reports that gold/silver short squeeze could be imminent. On February 3rd, Andrew Maguire wrote Eliud Ramirez, a senior investigator for the CFTC's Enforcement Division, giving him the "heads up" for a "manipulative event" signaled for February 5th. He warned the CFTC that JP Morgan was about to manipulate down the price of silver after the release of non-farm payroll data on February 5th. Andrew said that the takedown would happen regardless of if employment was better or worse than expected and the price of silver would be flushed to below $15 per ounce. During the next couple of days, silver was crushed from $16.17 per ounce down to a low of $14.62 per ounce. Despite all of the evidence given by Andrew Maguire to the CFTC of gold and silver manipulation, Andrew wasn't allowed to speak at last week's CFTC hearing on limiting gold and silver positions held by banks like JP Morgan. Bill Murphy of the Gold Anti-Trust Action Committee (GATA) was allowed to speak (within a five-minute time constraint) and present some of Andrew Maguire's evidence, but right when his presentation began there was a technical failure of the live television broadcast, which was mysteriously fixed as soon as he was done speaking. Bill Murphy was scheduled for several mainstream media television interviews after the CFTC hearings, but they were all abruptly cancelled at once. The silver market provides a window into what is happening in the gold market. Because the silver market is very small and its short position is so concentrated, its price is easier to manipulate than gold, but the same manipulation is taking place in gold on a much larger but less noticeable scale. In our opinion, the CFTC is under pressure not to do anything about the manipulation because the lower gold and silver prices are, the stronger the U.S. dollar appears to be. If we saw an explosion to the upside in gold and silver prices, it would result in a complete loss of confidence in the U.S. dollar. NIA believes the precious metals markets are currently being artificially suppressed by paper gold and silver that doesn't physically exist. At last week's CFTC hearings, Jeffrey Christian of the CPM Group admitted that banks have leveraged their physical bullion by 100 to 1. This means for every 100 ounces of paper gold/silver that trade, there could be as little as 1 ounce of physical gold/silver in the vaults backing it. However, Mr. Christian sees no problem with this because he says "it has been persistently that way for decades" and there are "any number of mechanisms allowing for cash settlements." What Mr. Christian fails to realize is that most investors around the world holding paper gold/silver believe they own physical gold/silver. There will come a time when these investors don't want cash settlements in U.S. dollars, but they will want the physical precious metals themselves. When investors around the globe eventually call for physical delivery of their precious metals, NIA believes it will result in the biggest short squeeze in the history of all commodities. Howestreet reports about "New Dynamic" in the Gold Market. April 1, 2010 — The shorts in gold — and particularly the shorts in silver — felt some pain today. Gold climbed $11.80 to close on the Comex at $1125.10, a 1.1% gain for the day. Silver did nearly twice as well, up 2.1% for the day and ending at $17.876, the highest in ten weeks. The gold/silver ratio fell to 62.9 from 63.6 the day before. Now that the downward pressure put on gold and silver prices by the gold cartel for option expiry and quarter-end window dressing is behind us, it is no surprise that the precious metals have jumped higher. Physical demand — which is always the major driver of the gold price in the long-run — remains strong, as evidenced by high premiums pretty much everywhere. The big news that has now begun influencing the market is the stunning revelation by GATA at a Commodity Futures Trading Commission (CFTC) hearing last week about the London whistle-blower who had explained to the CFTC how JP Morgan Chase has been manipulating/capping precious metal prices. In a shocking parallel to the inaction by the SEC after receiving warnings from Harry Markopolos about the Madoff ponzi, the CFTC has apparently been sitting on this information. The whistle-blower, Andrew Maguire, is an experienced precious metal trader in London. In this riveting interview on King World News with GATA director, Adrian Douglas, Maguire describes a "new dynamic" impacting gold. Specifically, there is a huge short position in the market. But there is even more. The CFTC hearing confirmed what GATA has been saying all along, that the gold market is being manipulated. To achieve this manipulation, the gold cartel has accumulated a huge short position. Importantly, the hearing confirmed that the gold cartel's huge short positions are 'naked', meaning that these positions are not hedged. More to the point, the CFTC hearing revealed that there is 100-times more paper-gold outstanding than physical gold. The market is now starting to absorb the significance of what GATA has uncovered over the years and summarized succinctly in its prophetic announcement in The Wall Street Journal more than two years ago, seven weeks before the collapse of Bear Stearns and the start of the present financial crisis: "The objective of this manipulation is to conceal the mismanagement of the U.S. dollar so that it might retain its function as the world's reserve currency. But to suppress the price of gold is to disable the barometer of the international financial system so that all markets may be more easily manipulated. This manipulation has been a primary cause of the catastrophic excesses in the markets that now threaten the whole world." The revelations from the CFTC hearing are earth-shaking, and indeed a "new dynamic" has emerged. The gold cartel now has a big target painted on its forehead. One can never predict the future, but it seems to me that as this news about the gold cartel's huge naked short position spreads, two things will happen. It is inevitable that the big traders and hedge funds will push the naked shorts to the wall by asking for physical metal. We could therefore see more hedge funds switching out of GLD like Greenlight Capital did last summer, which leads to the second likely outcome. If we get a squeeze on the naked shorts, the sky is the limit for precious metal prices. The gold cartel may not yet be finished, and won't be until the unholy Wall Street-D.C. axis is dismantled. But the gold cartel is on its way out. Over the past ten years, the gold cartel has staged a controlled retreat. It has been fighting the advancing gold price with propaganda, paper short sales and the occasional dishoarding of physical metal from central bank vaults and more recently, the IMF. This retreat is I suspect about to turn into a rout, which means the upside potential for the precious metals is huge. Commodity Online asks will fraud lift gold prices to $10,000/ounce? NEW YORK (Commodity Online): After the sub-prime catastrophe in banking and realty sector, which led to the global recession in 2008-09, it is the turn of bullion markets now. 'FRAUD', that is the one word which comes to any investor's mind when s/he reads about the Commodity Futures Trading Commission (CFTC) hearing on manipulations in bullion market by gold cartels. So, the small and clean investors have been short-changed by big cartels during the past many years, especially during the recent boom time in bullion markets. Otherwise, how will you explain the biggest boom in paper gold (Exchange Traded Funds, ETFs) in the recent past with hardly any gold available in the market. Now read about the Commodity Futures Trading Commission (CFTC) hearing last week about a London whistle-blower who had explained to the CFTC how JP Morgan Chase has been manipulating/capping precious metal prices. In a shocking parallel to the inaction by the US Securities and Exchange Commission (SEC) after receiving warnings from Harry Markopolos about the Madoff ponzi, the CFTC has apparently been sitting on the information on gold cartels. Did you visit the websites of GATA and CFTC this week? If you do, you can see a lot of articles and responses from investors who have been keenly watching the developments in bullion market. The whistle-blower in this biggest gold fraud was Andrew Maguire, an experienced precious metal trader in London. In an riveting interview (which is available on the internet all over the world) with GATA director, Adrian Douglas, Maguire describes a new dynamic impacting gold. The fact is that, there is a huge short position in the market. The CFTC hearing confirmed what GATA has been saying all along, that the gold market is being manipulated. And, how? The gold cartel has accumulated a huge short position and the huge short positions are 'naked', which means these positions are not hedged. There is 100-times more paper-gold outstanding than physical gold. You must be saying Oh, My God! Then wait, there is more to it. Sub-prime crisis was peanuts before this scam. The bullion market is now slowly taking in the impact of these revelations. The result is, there will be no gold in the market. Because, if people ask for physical delivery of gold for their ETFs, who will give all the gold. THERE IS NO GOLD! And the price of gold can be $5,000 per ounce, $10,000 or may be even more. Who can predict the value of a commodity which is not there is the market? Commodity Online reports that fraud will spoil the image of ETFs. Gold ETFs: prudent investment or paper dream? LONDON (Commodity Online): Almost all market and bullion analysts in the recent years harped on a new investment option — the Gold Exchange-Traded Funds (ETFs). Till a decade ago, there were no easy options to invest in gold like the equities market. Realising this, innovative people brought out the gold ETFs to make gold investment easy for investors. The development of the gold ETF market in 2003 changed the way people invested in bullion. But when the gold ETFs came into the market, nobody anticipated a fraud will spoil the image of ETFs within 10 years of its existence. So, last week, when the Commodity Futures Trading Commission (CFTC) heard a case regarding manipulations in bullion market by gold cartels, the gold ETF scam hit the investors like a bolt from the blue. Now, the gold ETFs' image is at stake. Soon, investors are set to question the credibility of the gold ETFs. The reason is the facts emerged during the CFTC hearing. The CFTC hearing confirmed what GATA has been saying all along, that the gold market is being manipulated. And, how? The gold cartel has accumulated a huge short position and the huge short positions are 'naked', which means these positions are not hedged. There is 100-times more paper-gold outstanding than physical gold. So, if you are buying ETFs, be sure that there is no gold guarantee for your piece of paper which offers you the ownership of some specific quantity of the yellow metal. In reality, it is just a piece of paper which you bought paying huge sums. Recently, the World Gold Council reported that the world's total gold ETF market grew 85% relative to 2008. During the hearing Adrian Douglas of GATA said: I would just like to make a comment. We are talking about the futures market hedging the physical market. But if we look at the physical market, the LBMA, it trades 20 million ozs of gold per day on a net basis which is 22 billion dollars. That's 5.4 Trillion dollars per year. That is half the size of the US economy. If you take the gross amount it is about one and a half times the US economy; that is not trading 100% backed metal; it's trading on a fractional reserve basis. And you can tell that from the LBMA's website because they trade in "unallocated" accounts. And if you look at their definition of an "unallocated account" they say that you are an "unsecured creditor". Well, if it's "unallocated" and you buy one hundred tonnes of gold even if you don't have the serial numbers you should still have one hundred tonnes of gold, so how can you be an unsecured creditor? Well, that's because its fractional reserve accounting, and you can't trade that much gold, it doesn't exist in the world. So the people who are hedging these positions on the LBMA, it's essentially paper hedging paper. Bart Chilton uses the expression "Stop the Ponzimonium" and this is a Ponzi Scheme. Because gold is a unique commodity and people have mentioned this, it is left in the vaults and it is not consumed. So this means that most people trust the bullion banks to hold their gold and they trade it on a ledger entry. So one of the issues we have got to address here is the size of the LBMA and the OTC markets because of the positions which are supposedly backing these positions which are hedges, but it is essentially paper backing paper. So the giant Ponzi trading of gold ledger entries can be sustained only if there is never a liquidity crisis in the real physical market. If someone asks for gold and there isn't any the default would trigger the biggest "bank run" and default in history. This is, of course, why the Central Banks lease their gold or sell it outright to the bullion banks when they are squeezed by high demand for real physical gold that can not be met from their own stocks. Investing Contrarian reports that the world's largest fraud. The world Largest Fraud: 5.5 Trillion? Time you stood up. The Gold and Silver Manipulation spanning decades (going back well back into 1980s) has now taken mammoth proportions, one that could bankrupt not just a few banks but entire countries along with their central banks. Prime in this network are the Bank of England and the FED reserve who have been caught on the wrong side. For the first time now, the CFTC (The regulator) has a whistle blower testimony to make a legal move against the cartel of JPM and other trader network. In an incredible audio interview, the London based former Metals trader, Andrew Maguire, chronicled the silver manipulation, Trade by Trade in his running commentary to CFTC. This testimony is being ignored and being pushed under the carpet. Am yet to see main stream coverage of this mammoth fraud clinically and brilliantly uncovered by Andre Maguire, who is now a marked man for the cartel. He already has been involved in a Hit and Run case where a speeding car almost took him down. What is even more interesting, the driver has been caught and yet his testimony is still not being published. Why did he do it? Who paid him to do it? None of the details have emerged. But for those who are on the Internet and can help in letting this be know to all, this is that interview and must be downloaded and kept for records. No one knows when the King Wold News website will be taken down which brought us this interview with Andrew and Adrian. We have already had one extraordinary attack on the website couple of days back through a coordinated DOS attack. King World News today received more detail about yesterday's attack on its Internet site, which happened soon after the posting of Eric King's half-hour interview with GATA Chairman Bill Murphy, board member Adrian Douglas, and your secretary/treasurer about last week's hearing of the U.S. Commodity Futures Trading Commission. The major Internet hosting company that maintains the King World News site reported to King World News: "Your hosting account is the target of a distributed denial of service attack. To protect the network resources, we have temporarily placed your Web site behind a network filter. Once the attack has ended, service will be restored to normal. ... Computers were attacking your account." Those who have not heard the interview of Andrw Maguire, please do listen to this bombshell and make your judgement on why it is not being given the importance in US justice department. This man while guilty along with the others had the nerve to stand up to the cartel. At a point within the interview Adrian Douglas makes the point that the Gold Market in LBMA (London Metals Exchange) is to the tune of $5.5 Trillion. And that is Gold contracts cleared only in London. Imagine COMEX when added to those volumes. We are talking of a market which is more than the economy of China and nearly 60% of US economy. The important point note is that the market is not made of Physical Gold but paper contracts exchanged in the form of Futures trades. This gives us the illusion of Price discovery and allows the players in the market to control and manipulate Gold and Silver Prices at will. Let me address the cartel if ever they come across my writing: Truth will come out. Your days are counted. You will be taken down. Every reader of this should make your own judgments on the sequence of extraordinary events that have occurred from Jan 2010 to March 2010 including the Andre Maguire Testimony, his near Death, CFTC hearing going blank at critical times, and most importantly the forced ignorance of this mammoth Fraud which is being ignored by Main Stream even to the point of not having the desire to look one level deeper into all the Mire and dirt in the Precious metal markets. Timiacono.com reports that Gold, Silver, the CFTC & Conspiracy Theories. Not being much of a conspiracy theorist, last week's hearing by the CFTC (Commodities Futures Trading Commission) on futures market trading for metals was a subject of some interest to me, but the news flow since that time has been rather remarkable — if for no other reason that none of the news seems to be flowing in the mainstream media. In fact, a search at the Wall Street Journal on "Gensler" (CFTC Chairman Gary Gensler would surely be included in any report) produces only this one item from before the hearing. You'd think that, if a news organization that normally finds time to report on the most arcane of financial market goings-on saw fit to publish a story before the hearing was held, they'd also figure it was worthwhile to let their readers know what happened at the hearing. Imposing new speculative trading limits on metals futures contracts is unwarranted and could have an adverse impact on U.S. markets, some exchange and bank officials will tell the Commodity Futures Trading Commission Thursday. Later in the story they mention that GATA (Gold Anti-Trust Action Committee) chairman Bill Murphy was planning to speak though, curiously, they failed to mention him by name and then, even more curiously, they followed this mention up with almost three times as many words bashing those, like Murphy, who allege manipulation in these markets. One of the staunchest believers in the allegations of gold manipulation—the chairman of the Gold Anti-Trust Action Committee—will testify as well. But others, including the CME's Mr. LaSala and John J. Lothian, a commodity trading advisor, futures broker and the head of a well-known markets newsletter, will urge the CFTC not to pay attention to arguments that there has been manipulation. "Those who believe gold and silver markets are manipulated to keep prices low are nothing more than politically opportunistic rent seekers in my book," Mr. Lothian planned to say. "They are parasites on the body public profiting from selling fear and seeking political change that will benefit their world view and related market position." Now, that's some stunningly unbalanced reporting on a subject that, admittedly, anybody anywhere near Wall Street probably doesn't want to contemplate — that markets are rigged. But, in the broader scheme of things, wouldn't it be better to just let "those crazy gold bugs" have their day and be discredited once and for all if they really are as nutty as the WSJ would have us believe? Well, if you read the Wall Street Journal, you'll never know what happened at the hearing and whether the CFTC paid any attention to them, but, if you look elsewhere, you'll read about all kinds of interesting developments during and after the meeting. Some observers feel that the Gold Anti Trust Association (GATA's) long held views on a conspiracy by some major banks and government entities to manipulate precious metals prices are off-target, but the latest evidence produced by GATA chairman Bill Murphy in open testimony at the CFTC hearing is compelling assuming the source material is accurate. The evidence came in the form of a series of emails, and accompanying commentary, from a London metals trader, Andrew Maguire, who contacted GATA on March 23rd regarding alleged rigging of the precious metals markets by JP Morgan among others, through shorting the markets around key economic data releases, describing in detail how this is achieved. Maguire, Murphy contends, informed the CFTC enforcement division of this market manipulation ahead of the release of farm payroll data in February this year and set out not only how the manipulation would be achieved two days in advance, but also sent real time emails to the CFTC investigators as the alleged manipulation was taking place. According to Murphy the metals prices followed the scenario precisely — something which he felt could not be predicted without prior knowledge of the manipulation of the markets by major players with huge financial clout. Now, why couldn't the Wall Street Journal report something like that? It seems to be a rather important development and one that anyone even remotely related to the gold and silver market would surely be interested in. For the first time ever, a whistleblower has stepped forward citing specifics of a market rigging as it was occurring in real time. Now, there were more than a few strange goings on at the hearing, one of which was that the video feed went dead just as Bill Murphy was about to detail the Maguire story for the CFTC. Here's the video (that no one was able to see at the time) in which Murphy details Maguire's charges that massive short positions by HSBC and JP Morgan aimed out flushing out longs occur regularly and predictably, in a coordinated fashion. The fact that whistleblower Maguire was struck by a hit and run driver in London the next day adds to the intrigue. He was apparently not injured badly as he was able to do an interview with Eric King a couple days later in which he sounds completely sane (see link from above). Of course, the case that the "gold bugs" should be ignored wasn't helped by Jeff Christian of the CPM Group clumsily defending the current system and, in the process, essentially, admitting that there is little or no actual precious metal backing the trading in London — that it's strictly a "paper market", which, to most people makes no sense. How can you have "price discovery" on a futures market when few of the sellers have anything to sell? You'd think there's something in here that the Wall Street Journal would have found newsworthy. Reuters filed this report after the conclusion of the hearing and they too failed to mention anything other than opposition to any idea of position limits in metal markets. A Google News search on "Gensler" confirms the virtual blackout by the mainstream news media, the only source of information coming from, well, blogs just like mine. You'd think the mainstream media would at least acknowledge that something happened. Jesses Cross Roads Cafe reports about "The Biggest Fraud in the World". "The Biggest Fraud in the World"
I do not know what to think about this, except to just offer it up to you for your own information. I am disappointed, however, that only the blogs, and almost no one in the mainstream media, have bothered to cover this story and to speak to the principals, and to either debunk them, support them, or even consider what they have to say. This really is like the Harry Markopolos story, trying to get a hearing on the Madoff ponzi scheme, and being repeatedly ignored, intimidated, and discouraged in every way possible by the establishment, and even fearing for his life. Even if this is a mistake, a hoax, some conspiracy, it deserves a proper hearing and an airing in the public. Ignoring it raises even more questions, and serious concerns about the integrity of the US markets. If instead of a proper airing there are only the smears, and disinformation, and the usual sly ad hominem attacks, or even worse, I will begin to believe that it is true. I cannot believe that testimony is being completely ignored. I do not understand why this is a 'national security' issue. It seems just too bizarre to me. Do people inside the trade know something that we don't know? Are these fellows frauds or just mistaken? Is this a hoax? Part of some conspiracy? Or is this something coming right at us, that will end up hurting the public once again, as the rampant fraud in the financial markets has done so thoroughly. If there is something going on then it is time to bring it out into the open. If it is national security concern, or more properly the national interest, because it involves the US banking industry, how long do they think they can keep this sort of thing quiet? If this is something else, why is it not aired, investigated, and nipped in the bud? I am trying to keep an open mind on this, but it is not being made any easier by what looks like a curtain of silence while the stories and counter-moves are prepared. I was disappointed that in the interview they never seemed to discuss the hit and run car incident. I don't want to speculate or get paranoid on this but its not easy. We deserve to know the truth. Note at night: I have now listened to this tape five times, carefully. It is a bombshell. This has to be dealt with, one way or the other. Bring it out into the light of day, and let the facts be known. This is either the equivalent of the fictionalized testimony on the order of the Salem Witch trials, or one of the most damning accusations of malfeasance in office against quasi-governmental agencies, and probably US officials, since Teapot Dome. Giving the mainstream media the benefit of the doubt, they are afraid to touch it because it is radioactive. They will wait on the sidelines until something happens. And the strategy seems to be to stonewall, and hope it goes away. The American public is nortoriously fickle and if not reminded of it will move on to the next shiny thing, the next controversy of any type. Marke Trap reports that Manipulating Gold (GLD) and Silver (SLV). Everyone from U.S. Senators to prominent hedge fund managers say that criminal naked short sellers had a hand in the financial collapse of 2008, but the regulators aren't listening. Not a single criminal has been prosecuted. Indeed, the regulators continue to allow the miscreants to manipulate the markets — not just the stock markets, but also the markets for corporate bonds, derivatives, U.S. Treasuries, and all manner of commodities — even when the regulators are provided with indisputable evidence of a massive crime in progress. They could easily fix the flaws in the settlement system that allow much of the manipulation to occur, but they refrain from doing so either because they are too captured by the miscreants or too cowed by the possible consequences of throwing the lights on what may be an enormous confidence game. So I am inclined to say that it is hopeless. Everyone loves an optimist — but, yes, it is hopeless. We are like the audience in one of those cheesy horror flicks — yell and scream all you like, but the dumb blonde is still going to walk into that room and get hacked to pieces. Except that it is not a movie. It is real. And it's not just the dumb blonde who is going to get slaughtered. It is all of us. It is our economy. It is our standard of living. It is our financial system — the lifeblood of the nation. The latest case of regulatory indolence was recently exposed by Andrew Maguire, a successful metals trader and whistleblower who went to the Commodity Futures Trading Commission with data that strongly suggested that a small number of criminal short sellers had rigged the markets for silver and gold. Maguire not only provided the regulators with a Dummies' guide to how the manipulation generally worked, but also warned them of a specific crime — a dramatic take-down of the gold [SPDR Gold Trust (NYSE:GLD)] and silver [iShares Silver Trust (NYSE:SLV)] markets — that he said would occur at an exact time on a specific date in the near future. That is, Maguire told the regulators that a massive crime was about to happen, and the crime happened precisely as he predicted it would. With Maguire's warning, the regulators were able to watch a crime unfold, right before their eyes, in real time. Then the regulators thanked Maguire by saying, in essence, "you're a nuisance, go away." This is not just appalling, but scary, because the criminal activity that Maguire exposed is much bigger than the Madoff Ponzi scheme, and more likely to result in serious damage to the American economy. Indeed, there is a strong case to be made that our national security is at stake. As Maguire stated in a recent interview with King World radio, the manipulators have likely created a massive naked short position that can easily be exploited by foreign entities who might see financial or even political gain in eviscerating the dollar. After that, Maguire sent several more emails detailing manipulation of the gold and silver markets. He received no replies. So he wrote a final email, providing still more evidence in support of his case and stating: "I have honored my commitment to assist you and keep any information we discuss private, however if you are going to ignore my information I will deem that commitment to have expired." To that email, a CFTC official finally replied: "I have received and reviewed your email communications. Thank you so very much for your observations." That was it. Thanks a lot and goodbye. No follow up questions. No acknowledgement that a crime had occurred. No apparent interest whatsoever. Maguire was understandably peeved. As he said in his radio interview, "I kept a live commentary going on that entire scenario. How they were going to flush it down below 15, how it then went down below 15, and how then they were putting big block offers hitting all the bids to stop it getting back through the technical level of 15 so as not to trigger covering by the shorts and inviting longs to get long again. To me, you don't get any better than that, how could anyone predict that unless they knew what was going to happen, not just saying it's going to move in one direction, but it's going to move in one direction then another direction — all in a matter of minutes." 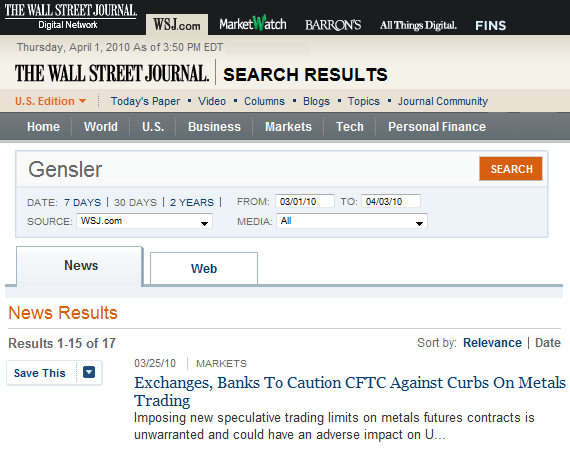 Not long after the massive crime took place, the CFTC held a public hearing on manipulation of the metals markets. Maguire was specifically barred from participating. He told King World radio that he believed one CFTC official, Bart Childers, wanted him to attend the hearing, but Childers is a lone "Elliot Ness" crime fighter working in an agency that is dominated by the feckless and the corrupt. "There are a lot of people at CFTC wanting to look the other way," Maguire said. What Christian was saying is that every ounce of gold or silver is being sold 100 times. This would not be problematic if we were speaking of some dusty market in Central Asia with rows of traders' stalls wherein some commodity (such as gold, silver, radios or Kalashnikovs) were being sold and resold in rapid-fire succession: there, our sensibilities about scarcity, value, and price discovery would actually grip reality. Here, however, we are talking of markets where the distinction between reality and representation has become as blurry as the last round of a game of musical chairs, enabling some sellers to offload paper IOUs promising eventual delivery of silver and gold — promises that would be impossible to keep if some small segment of the buyers were to demand delivery of the real thing. This is quite similar to the naked short selling of stocks, where traders sell stock that does not exist, but enter IOUs in their computers, and then "fail to deliver" what they have promised. It is hard to distinguish this from fraud (notwithstanding the Efficient Market Hypothesis of financial theory, which maintains, essentially, that it shouldn't matter). Christian, the fellow who inadvertently revealed the massive naked short positions in gold and silver, said that he didn't see this as a problem because "there are any number of mechanisms for cash settlement," and "almost all of these short positions are in fact hedges..."
This is slightly absurd. Later in his testimony, Christian himself said that it was "exactly right" to say that the hedges are nothing more than hedges of "paper on paper" — a particular sort of merry-go-around where one IOU is settled by another IOU, with these IOUs outnumbering real gold and silver by multiples of a hundred times. As for the notion that cash settlement solves the problem, Maguire noted in his radio interview that cash settlement "is the very definition of default. If somebody wants to buy gold and silver and instead they're given cash, that is a default." In addition, "there are people who will not want cash — Chinese, Vietnamese, Russians — people looking for the metal, they will want to take it, and that will cause a default on the Comex [the metals exchange] because the Comex will be drained...that was the word that was used by several people making testimony [at the CFTC meeting], that the Comex would be drained..."
Maguire added: "What's going to happen, if you're an Asian trader, or a non-Western trader, who has no loyalty, or doesn't care about homeland security or anything else, who says, now wait a minute, if I can establish in my mind that there is 100 ounces of paper gold, paper silver for example, for each ounce of real silver, than I have a naked short situation here that I can squeeze and they can go on the spot market which is basically a foreign exchange transaction, short dollar, long silver to any amount they want — billions, trillions — whatever they want, and they can take this market, squeeze this market, and blow it up..."
In other words, the problem isn't just that criminal naked short sellers manipulate the metals market downwards. It is that they have created a condition where a foreign entity can merely demand delivery of real metal to induce a massive "squeeze" that sends the price of metals skyrocketing, putting huge downward pressure on the dollar. Meanwhile, says Maguire, with prices rising, "for 100 customers who show up there is only one guy who is going to get his gold or silver and there's 99 who will be disappointed, so without any new money coming into the market, just asking for that gold and silver will create a default." "There are no prisoners taken in this kind of environment," Maguire added. "All they need to establish is that it is naked, and by the admission of [former Goldman staffer] Christian at the meeting...we have a definition of physical actually being paper...They get that in their heads and its locked, it's a done deal, then we don't have to wait...there is a profit to be made here, and there is nothing [anybody] can do about it because it's a foreign exchange transaction, and there are no limits on a foreign exchange transaction, and obviously foreign exchange transactions are coming to light, there [is talk] of manipulation..."
Indeed, Maguire says that he has received phone calls from wealthy individuals in Asia looking for the go ahead to exploit the naked short position. "The only question they have in their mind is can we establish that this is a naked short position, that's the only thing they had to clarify, it's become clear, it is now clear [that the naked short position is massive], and no doubt they do their own due diligence, but basically [the naked short position] has been admitted at the only metals meeting [the CFTC hearing] that we've ever had..."
Maguire says that the naked short selling scam is in the trillions of dollars, making it by far the biggest financial fraud in history. He calls it "financial terrorism" and accuses the naked short sellers of "treason" for putting national security at risk. It might be hard to believe that foreign entities are plotting to crush the U.S. economy, and perhaps they are not, but there is no doubt that loopholes in the clearing and settlement system — not just for metals, but also stocks, bonds, Treasuries, and derivatives — could quite easily be exploited by any foreign entity desiring to do harm to the U.S. economy. The only dispute is whether such a desire exists. Maguire and Adrian Douglas of GATA, an organization that lobbies against manipulation of the metals market, took their concerns to the mainstream media and had a number interviews scheduled. However, every one of those interviews were suddenly cancelled. This is not surprising. The mainstream media has consistently shied away from stories about illegal naked short selling and market manipulation, partly because the media outlets are captured by the powers that be on Wall Street, and partly because investigative journalism is now viewed as an anachronism — a time-consuming effort that might have been suited to Woodward and Bernstein back in the 70s, but not to the downsized news rooms tasked with churning out tepid and meaningless "he said, she said" mimeographs for a population of readers who (so it is said) want their "news" fast, and don't care a whit for in-depth reporting. Meanwhile, just as the stock manipulators have engaged in a coordinated effort — deploying threats, ruthless smear campaigns, and slick lobbying — to keep their crimes out of the spotlight, so too will the gold and silver manipulators. Adrian Douglas of GATA notes that at the precise moment he began to speak at the CFTC meeting, the video camera recording the event experienced "technical problems" — problems that were fixed at the precise moment when Douglas stopped talking. Douglas concedes that this might have been a coincidence, but when this sort of thing happens often enough, a little healthy paranoia is probably a good thing. That said, everyone loves an optimist, so I'll say the camera really went kaput. But...ack...another coincidence: The day after Maguire gave his radio interview, he was the victim of a hit and run collision. Somebody sped out of a side alley at top speed, smashed into Maguire's car, and then tried to escape. A high-speed chase ensued, and the perpetrator was caught by police. The British press has reported that this might have been an assassination attempt, or a threat, but as yet there has been no word from the police. Maguire was injured, but not seriously. Let's be optimistic, and say this was an accident — assassinations and threats only happen in the movies. But...ack...another coincidence: Shortly before somebody crashed into Maguire's car, the CFTC caught on fire. This fire happened to be located in the one small basement room where gold and silver trading data and other pertinent documents were kept. 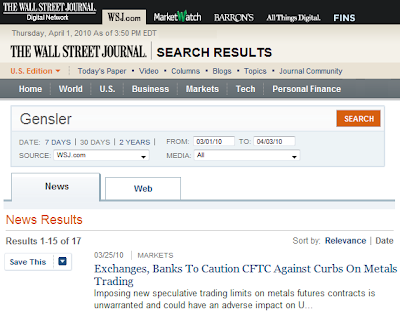 The CFTC claims that its investigation of metals manipulation, for what it was, did not burn. So maybe it was just an accident. Maybe some eager CFTC regulators were down there smoking cigarettes. Maybe it was stress. Maybe they'll keep investigating. Maybe they'll bust the criminals. Maybe, just maybe...yes, everyone loves an optimist, so let me make this clear — the horror show that is our regulatory system is going to have a happy ending. There will be no massacre. The financial system will be just fine...really...maybe... or maybe not. Update: Another coincidence: GATA reported recently that there has been an attack on the King World website — the website that contains the radio interview of Maguire and his emails to the CFTC. This was an apparent attempt to shut down the website and prevent the scandal from being exposed further. The Internet company that hosts the King World website reported to King World the following: Your hosting account is the target of a distributed denial of service attack...Computers were attacking your account." My reaction: Gold manipulation has been officially confirmed by the CFTC hearings held on March 25. 1) For the first time ever, a whistleblower, Andrew Maguire, has stepped forward, providing specifics of a gold/silver market rigging by JPMorgan as it was occurring in real time. 2) There is no gold corresponding to the vast "gold deposits" at the major LBMA banks. During the CFTC hearings, Jeffrey Christian of CPM Group (one of the most respected precious metals consultancies) stated that "precious metals...trade in the multiples of a hundred times the underlying physical..."
3) Almost all of the trading activities on the London exchange were merely settled by paper for paper, not for physical metals as the exchange supposedly requires. 4) There are thousands of clients (Asian and Middle Eastern governments, sovereign wealth funds, etc) who think they own hundreds of billions and perhaps trillions of dollars of gold bullion, and are being charged storage fees on that fantasy bullion, but what they really own unsecured gold loans to the banks at a negative interest rate. 5) It is impossible for the London exchange to ever deliver all the gold and silver owed to the owners of contracts. 1) The live television broadcast of the CFTC hearing suffered a technical failure right as Murphy was set to begin his testimony. This was corrected right after Murphy was finished. 2) At least one live voice broadcast (radio) failed during Murphy's presentation. 3) After the hearing, Murphy was contacted by several major media outlets for more interviews. Within 24 hours, all the interviews were canceled. All of them. 4) The day after Maguire gave his radio interview, he was the victim of a hit and runcollision. Somebody sped out of a side alley at top speed, smashed into Maguire's car, and then tried to escape. A high-speed chase ensued, and the perpetrator was caught by police. Although the British press has reported that this might have been an assassination attempt or a threat, there has been no word from the police. 5) Shortly before somebody crashed into Maguire's car, the CFTC caught on fire. This fire happened to be located in the one small basement room where gold and silver trading data and other pertinent documents were kept. 6) A few days after the CFTC caught on fire, there was an DOS (denial of service) attack on the King World website which contains the radio interview of Maguire and his emails to the CFTC. 1) Only the blogs, and almost no one in the mainstream media, are covering the relevations of the CFTC hearings. 2) At the Wall Street Journal, a search on "Gensler" (CFTC Chairman Gary Gensler would surely be included in any report) produces only one item from before the hearing. Readers of the Wall Street Journal will never hear what happened at the hearing and whether the CFTC paid any attention to them. 4) A Google News search on "Gensler" confirms the virtual blackout by the mainstream news media. 5) The media's strategy seems to be to stonewall and hope scandal goes away. "Sub-prime crisis was peanuts before this scam." "This is a potential multi-trillion dollar fraud that could bring down the world's financial system." "It is a bombshell. This has to be dealt with, one way or the other. Bring it out into the light of day, and let the facts be known. This is either the equivalent of the fictionalized testimony on the order of the Salem Witch trials, or one of the most damning accusations of malfeasance in office against quasi-governmental agencies, and probably US officials, since Teapot Dome. " 3) The upward explosion in gold prices will result in a complete loss of confidence in the U.S. dollar. Conclusion: Last October, I wrote about the Gold Market Reaching The Breaking Point. Well now we are there. 1) Consider this a final warning about the gold market. You aren't going to get much, if any, further confirmation of gold market fraud before it is too late. I would be amazed, especially considering recent relevations, if the gold market manages to make it passed June intact. 2) If you wondering how it will all end, I believe there will be a big "financial freeze". Checking accounts, money market accounts, brokerage accounts, etc... everything will become inaccessible. The New York Times article below about the 1987 market crash should give an idea what will happen when the settlement process breaks down in gold and other commodities. LAST Oct. 20, a day after the nation's financial markets collapsed, Goldman, Sachs & Company and Kidder, Peabody & Company found themselves short of cash by a total of more than $1.5 billion, according to people close to the firms. The shortfall resolved later in the day was not the result of trading losses or poor business strategy, but of failures in a behind-the-scenes process that attracted little attention until the crash. The process, known as clearing and settlement, is the linchpin of the financial system, the mechanism for the transfer of money among brokerage firms, their customers, the stock and commodities exchanges and the banks. Through it, cash is shifted from buyer to seller when trades are made. Money is also transferred among a myriad of commodity and options accounts to adjust for changing requirements for margins, which are essentially deposits on futures and options contracts. The amount of money required fluctuates with the value of the account. Usually, the clearing process works smoothly. But during the crash, it proved to be frighteningly fragile. Indeed, Government and market studies of the crash and interviews with Wall Street professionals show that the flow of money through the nation's markets came perilously close to gridlock on Oct. 20 because of chaos in the clearing system. For several hours that day, bottlenecks appeared throughout the pipeline, creating potentially crippling credit squeezes for even the biggest players. Kidder and Goldman, for example, had advanced the more than $1.5 billion on behalf of customers to cover calls for more margin initiated by plummeting prices. But the firms' banks were slow to credit the firms with an equivalent sum from the customers' banks because of many delays along the line. Moreover, the clearing process drained billions of dollars out of the markets at a time when some of that money might have been used for purchases, thus slowing the collapse. Instead, to meet their margin calls, investors had to use cash reserves, borrow or sell out their positions. That further depressed prices. Making a trade, like writing a check, has no value unless the clearing and settlement process works, backing up those transactions with cash. But while all banks clear checks in essentially the same way, the clearing systems of the various stock and commodity exchanges are a hodgepodge that do not always mesh well together. Last October, the different clearing systems put conflicting demands on virtually every big market player, creating unprecedented problems for investors and for the clearing systems themselves and raising terrifying concerns about market safety. ''A major mechanical breakdown, a liquidity problem or, even worse, default in one of these systems has the potential to seriously and adversely affect all other direct and indirect participants in the system,'' said Mr. Corrigan in his speech last spring. ... critical questions about the crash that were raised by the Brady Commission report and other studies have not been answered: When does the financial responsibility of one player in the market begin and end? If a clearing firm or a customer defaults, is a brokerage firm or a bank left holding the bag? With the answers unclear, experts said that future problems in the clearing system could well tie up many market players in court. ''The day that there is a default in the clearing system, everyone will be calling their lawyers, not their bankers,'' said Mr. Russo of Cadwalader, Wickersham & Taft. As for me, I've moved to Russia and have launched a fund to Invest in Russian Black Earth farmland. I believe owning hard assets outside the US financial system is going to become very attractive in the near future. Please email me if you're interested. This entry was posted in Currency_Collapse, Gold, Key_Entries, Wall_Street_Meltdown. Bookmark the permalink. And yes, I believe also other hard assets outside America and Europe would rise in value, when they're hitting the wall. This is big news but an awful lot of text. Gotta read it later cause it will take time. It looks like it's time for gold to finally catch up with the money creation. I've been waiting for this a long time. Thanks for an interesting blog Eric. "price of a commodity which is not available at all can go up to any level due to the sheer fact that it is not there in the market"
And what if the short side goes bankcrupt? Panic selling? I'm about to sell all my silver coins I've been buying and here's why. Here is an email I wrote to Jason Hommel of silverstockreport.com and in conclusion hoping for an explosion in the silver price is hoping for people to not only change what they invest in but to change the way they invest. People usually invest in derivatives of assets and not the physical assets themselves and hoping for them to start investing in physical silver is hoping for people to change the way they invest. Subject: What are the chances that silver supply stats are wrong. 1 way is: Silver is cheaper than gold because even though there is less supply of silver than gold above ground there is allot more demand for gold in relation to the gold supply than there is demand for silver in relation to the silver supply. Basically silver supply is extremely small but silver demand is extremely smaller. While Gold supply is also extremely small but gold demand isn't much smaller in proportion. Which explains why silver is cheaper than gold even though it is more rare. The 2nd way is: The silver supply is abundantly more than the gold supply and the demand for silver also very small. This would explain why silver has continued to remain so much cheaper than gold. The silver bug like yourself would agree with the 1st way while those who dismiss the "claim" that silver is more rare than gold would agree with the 2nd way. My question is what makes you so sure that the reason silver is still so much cheaper than gold is because of the 1st way and not the 2nd way? Mike Maloney said that silver has been out performing gold in the first 7 years of the last 10 years. Is that out performance the beacon we need to assure us that silver is or is becoming more rare than gold? Is that the proof that silver has been becoming or currently is more rare than gold? Besides that statistics, what market moves or anything for that matter gives you assurance that above ground silver is more rare than above ground gold?" "I know the silver stats are valid based on what I see everywhere. IE, not one person in 1000 is interested in silver, and is not buying. Note your dad's reactions as you told me over the years. There is knowledge vs. total blind guesses. We have knowledge. Those people who reject silver, assuming it is plentiful, are going off total blind guesses." "I know what you mean, and I was about to say that I found it hard to believe that so few people see the opportunity for profit that comes with investing in physical silver but then I realized it's really not that hard to believe when you think about how the world invests today. Most investments are electronic derivatives. Very few people invest in any hard assets. I bet very few people can actually hold their investments in their hands whether it be silver, gold, an electronic device, motor vehicles, apples, sneakers or any hard asset. Most investments are derivatives of hard assets and not the hard asset itself. So it's not so hard to believe that only a very few people are investing in physical silver despite the physical supply being dwarfed by the amount of money circulating the world, most people aren't investing in physical ANYTHING, most investments are derivatives of hard assets and not the hard asset itself. It's almost like people today don't know how to do hard asset investing because they are so used to investing in derivatives of the hard asset instead of the hard asset itself. So the question is, how are we going to get a world who's idea of investing is mainly based on derivatives to move to becoming a world that invests in the physical asset instead of the derivative for the physical asset. Because I believe even if industrial demand pushes silver to like $25/oz and this price rise attracts more people to silver for an investment, more than likely those people will invest in the derivative of silver and not the physical silver itself. It's going to take more than a rise in price to move people from investing in derivatives to physical assets, it's going to take a shift in the way people invest. This is more than just about investing in physical silver, this is about investing in anything physical, a way of investing that is foreign to most of the world. A world full of derivative investors you are expecting to move to become physical investors. And yes, I understand it won't take the whole world to become physical investors in physical silver for the price of silver to shoot up high but even getting that small amount of people is a feat. The world has a derivative investing mindset, very few people actually do physical investing. At first my revelation of how the world invests would seem to have explained why silver is a great investment but the irony is that my revelation of the mindset of how the world invests reveals that silver is no more better than any invesment. Unless you are expecting industrial demand for silver to be the reason for silver's future rise in price, you are basically expecting the rise in price of silver to come from the world changing the way it invests, from investing in derivatives of hard assets to investing in the hard assets itself. So you see the irony? At first I found it hard to believe that only a few people saw the opportunity for profit that silver brought leading me to believe that the statistics were questionable and then I realized that most people don't invest in hard assets but instead they invest in derivatives of hard assets, so then for a second I thought maybe you were right and that silver is in a position of a lifetime but then I thought about it, if most people's investments are derivatives of hard assets and not the hard asset itself, what hope do we have in changing people's mindset of investing. It's one thing to change what people invest in, it's a whole different thing to change the way people invest. So unless you are saying industrial demand for silver will grow far more than the physical supply of silver aren't you hoping to change the way people invest by hoping they buy the physical silver over the derivative for the silver? Seeing as most investments are done with the derivative instead of the hard asset itself." On top of that gold or silver is no more a hedge against hyperinflation than any other asset is. Like in Zimbabwe it takes the same amount of gold to buy a loaf of bread that it takes to buy a loaf of bread in the US. I think it was like .01 grams of gold for a loaf of bread and if you changed .01 grams to US dollars it would give you the same amount of US dollars that it costs to buy a loaf of bread in the US. So it won't make you rich, it was just keep it's value, like everything else will besides the currency. And when I first heard of the gold for bread thing in Zimbabwe I thought that it was just the start of gold becoming money in Zimbabwe and that that was the reason gold was still so cheap in Zimbabwe, but that is not true, even in hyperinflation people aren't running to hoard physical gold and silver. If all you care about is protecting your savings from hyperinflation of the currency then yes gold and silver will do that but if you are looking to get rich off of silver and gold you will be disappointed. On top of that industrial demand is controlled/driven by the banks because the growth of a nation depends on the amount of loans a bank makes to the citizens and businesses. If industrial demand was any where near bringing the silver supply close to extinction, the price of silver would be allot higher than it is now. I don't believe those that say it will happen in a short instant, like in a week silver will go up $20. Industry doesn't eat silver up like that so the prices shouldn't move like that. And the only reason silver jumped to $50/oz in 1980 was because it was cornered. It was an unnatural event. It had nothing to do with day to day investing or industrial demand. It was a planned cornering that brought the price that high that quick. Are you really going to bank on that happening again? And even if it did, you would know it was artificial and would not last, plus there is no way to tell when it will happen or when it will end, it more than likely would end just as quick as it did in 1980. You seem to miss that every currency is falling against silver, some are just falling faster, and the US dollar has in the past decade been one of the fastest falling of all major currencies. I think you know that almost every currency have coins made of gold and silver if you take some really old ones. The nominal value of those coins are often just 1/100th or so of the precious metal value today, which means that the currency since the coins were produced has lost around 99 percent of its value. So I don't think it's a good idea to sell your silver coins. @Sebastian, numonic is well aware of that, you misunderstood his message completely. Numonic, i believe you are almost right, but check for CEF fund, ZKB funds, Sprott's fund, US mint silver coin sales, China encouraging people to buy, silver leaving Comex depository and SLV. These are real metal according to periodic table. What Eric is writting is leaking around and there can be fear/run in each day, although i agree it has been trumpeted already for 20 years. You see Stibot one thing I learned is that inflation(in the sense of rising prices) is not necessarily a bad thing but I understood the purpose of inflation. Inflation is not just an effect but a tool. It is a tool used to thwart demand for things that are necessary to someone. Food is a necessity for an individual person like you and me, physical silver isn't because we don't use silver, we let it sit in a safe and don't do so much as look at it every so often, if at all. If all physical silver investors are doing is taking the metal and letting it sit in a safe, they are proving it is of no use to them and when time comes to show and prove that it isn't, they will show by selling the silver for necessities. There will be very few people holding on to physical silver if they don't have food to eat. And granted we are not in a situation where the whole world is starving but i came across an article last week that took a poll showing that $1 million is no longer enough to retire with and on top of that 90% of people have less than $10,000 for retirement. You really think that there are people out there that are able to say: "I'm not selling my silver for less than $100/oz"? Especially when all they are doing with their silver is letting it sit untouched in a safe? This is why I believe if the price of silver is really going to go high it's going to happen by those that use the silver, such as those that use the silver for products they make. And that is why I say unless industrial demand is going to eat up all the silver, I don't see the price of silver sky rocketing like some people do. And on top of that, I say again, if industrial demand was any where near making physical silver extinct, the price of silver would be way higher than it is right now. And if one day in the future silver is going to be extinct, it won't come too fast to notice like the 1980 price move, it will be a gradual move, moving at the same pace industry uses up silver and industry can not eat up silver fast enough to make the price shoot up as fast as it did in 1980, it takes cornering the market and artificial demand to generate that type of price move and like I said if the demand is artificial it won't last, just like what happened in 1980. Plus there is a reason people choose electronic over physical assets(silver). Most investors are in to trading rather than buying and holding. And it's allot easier to trade electronically than physically. The way to make profit off of silver isn't buying and holding, it's trading(buying low and selling high). And it's allot easier to do that with electronic silver than it is with physical silver. People believe that they can make more money trading silver than they could by holding silver over a period of time. Plus no one knows if the silver run/hyperinflation will happen in their lifetime so instead of taking the chance of holding silver for the silver run which they're not sure will happen in their lifetime, the people choose instead to take profit immediately by trading(buying low and selling high) today. And it's allot easier to do that electronically than physically. Even silver/gold arbitrage can't happen because if you tried to get the premiums on the physical silver up by buying up all the physical silver, well the COMEX would default and you wouldn't be able to get the cheap silver to sell on the market for a higher price. So that's even less incentive for people to buy up the physical metal. And I don't get some of these gold/silver bugs, they are basically saying that the price of silver is too low for new silver to be mined and this will cause the price to rise. So stop the "manipulation" and let the price rise so that more silver can be mined so that the price can fall. Basically they say the price is low, they are not happy about the price being low but their ultimate goal is to have the price be low. Ridiculous. And before investors start demanding delivery they'd have to have incentive. They'd have to ask themselves can I sell this physical gold/silver for more than I paid to have it and paid to have it delivered to me from the COMEX? And the answer right now is no. There are premiums on the physical metal but they are not high enough to support an arbitrage move. Plus you have to think of how much the exchange will pay you to take a cash settlement instead of physical delivery. With that you'd make allot more money getting a cash settlement than you would taking physical delivery and selling the physical gold. So there is no support for arbitrage thus no incentive to take delivery. Only thing keeping me from selling my silver right now is that I don't know a better buy and hold asset to have and keeping the money in the bank at .35% or a CD at 1% to 2% is not more than the rate I'd get from holding it in silver. And I don't know if I am ready or have the time to do any buy low sell high trading. Thankfully if I decided to sell right now I'd be making a profit. But you know what, I'm holding on to my silver. I think I over reacted because my hopes of silver going to an astronomical price was dashed. But I have yet to come across a better buy and hold investment than silver, well aside from gold. I have to look in to the moves of stocks to see what's been doing better. But then you know I think there's rules with stocks, if your stock goes below what you initially paid for it, I don't know I really have to look that up too. Which is why I am not selling my silver yet. Too bad, such things happen, and I still see no point in selling one's silver coins. But look at this: New York Post has written about the manipulation of gold and silver prices! That means the so called mainstream media no longer totally ignore this item. Sebastian, you obviously did not read what i just wrote. There are basically two demands for physical silver: 1. Industrial demand and 2. investment demand. Industrial demand is no where near making silver extinct or in a shortage position otherwise silver would have a way higher price than it does now and it would have been getting that price as industrial demand ate up supply. It can't happen all of a sudden. Industrial demand doesn't eat up silver like that. The rise in price that you have been seeing in silver over the years is mostly due to industrial demand. That's the one good thing we can get to see from the small percentage of investment demand that goes in to physical silver. We get to see how much industrial demand is eating up silver. And we see that current silver supply has been and still is more than enough for industrial demand. Supply has been and still is more than meeting industrial demand. And is even meeting investment demand. Investment demand for physical silver will remain small because like every other investment, people would rather carry the derivative of the product rather than the product itself. Expecting people to carry the product rather than the derivative is expecting people to not only change what they invest in but also change the way in which they invest. It's like expecting people to stop using debit cards and only use physical cash and coins. Sure you can convince them that doing so will help their silver investment, but that's not totally true because of premiums. The physical has premiums and the small move each physical buy makes on the price of silver is probably less than the premium you paid. In the end you're always dependent on how many others purchase physical silver. So buying it yourself isn't really doing much. You can try to chase lows but it's a waste, you don't control how low it goes so it's a waste chasing it. After I realized this, the only thing keeping me from selling the silver was my thought that it would make me rich during hyperinflation. But all it would do is protect the wealth I already have not make me richer. But so would anything else that is not the currency and that includes stocks which is why even in hyperinflation physical silver is no more a hedge than a silver derivative would be or an agricultural stock. Hyperinflation is such a crazy situation, I'm still not exactly sure how the situation is. But all I know is industrial demand is no where near running out of physical silver supply, otherwise the price would be allot higher. Yes, it's true if it weren't for this recession, silver prices would be higher but it would probably only be at the highs of 2008, considering China didn't grow as much as it did in 2009(which I believe was to replace the lost consumption around the world in late 08 early 09). So basically if you're expecting silver prices to rise, you're expecting people to start hoarding physical silver. I'm still trying to find what would push INVESTORS(KEY WORD IS "INVESTORS" BECAUSE WE ALREADY KNOW INDUSTRIAL DEMAND HAS BEEN DEMANDING THE PHYSICAL METAL FOR DECADES AND IT HAS YET TO CAUSE THERE TO BE ANY WHERE NEAR A SHORTAGE OF THE METAL SO IF THERE IS GOING TO BE A SHORTAGE OF THE METAL IN THE FORESEEABLE FUTURE IT WILL HAVE TO COME FROM INVESTMENT DEMAND AS WE CAN SEE INDUSTRIAL DEMAND ISN'T DOING IT) to invest in the physical silver over the silver derivative. I'm also sure the govt. wouldn't do anything to push people to have incentive to buy the physical metal over the derivative. So you have to let me know, what will cause investors to start hoarding the physical metal instead of holding the derivative? Remember investors have no use for the metal, they only care about the value of the metal, so if the derivative and the physical metal are priced the same it makes no sense to hold the physical metal. It was on Liberty Silver's homepage I first read about gold manipulation being mentioned in newspapers like New York Post. Liberty Silver is a company that sells physical silver and other precious metals. Liberty Silver has also a lot of articles on gold and silver out of which some are translated to english. The following is from an article about price of physical silver vs. price of paper silver which can be found at http://libertysilver.se/pages.php/page/fysiskt_silver/language/en. "Can paper silver be trusted? As the price of physical silver has decoupled from paper silver, wealthy individuals, for whom it may be worthwhile to pay the fees associated and go through the paper work, are now starting to take delivery of physical silver. The result is that the physical silver in the Comex warehouses is gradually depleting. According to several newswriters such as Theodore Butler and Jim Sinclair, the result may be that Comex soon has no physical silver left for delivery causing the price of real physical silver to decouple even more from the price of paper silver. As a result of more and more people doubting that paper silver is backed up by physical silver, the price of real physical silver has decoupled from paper silver. The ironic of this is that if you bought paper silver such as futures or ABN certificates when silver was trading around $20, you have lost around 50% compared to your purchase price. If you however bought physical silver in Europe when the spot price was $20, you can still sell the silver for close to the same price." As for the industrial demand and investment demand, you can check out http://www.silverinstitute.org/supply_demand.php#demand. Photography and jewelry also demand a lot of silver. Demand for coins and medals is increasing sharply. Sebastian, even though investment demand with physical silver has increased, industrial demand for physical silver has decreased more which is why silver is still under it's 2008 high of $21/oz. And it seems that that article you quoted was written probably in late 2008 when spot price of silver took a big dive while premiums on physical silver at coin shops increased(actually just checked the link you included and I guessed right because it was written December 2008). That is not the case right now. Premiums have decreased from those levels. Leaving less incentive for investors to demand the physical metal. Before the incentive was arbitrage, where investors could get the metal cheap from the COMEX and sell it on the market for more because of the premiums but premiums have come down and the incentive for arbitrage is no longer there. I don't even really believe their could ever be a real arbitrage opportunity because the type of metal that was cheap on the COMEX was the 1,000 oz bars and I'm sure if you tried to sell the 1,000 oz bars in late 2008, there wouldn't be much of a premium on it. It was really the coins and small denominated sizes of silver that had the most premiums and unfortunately this is not the size silver you get when you take delivery from the COMEX. So prices will always be the same everywhere. People like to think that the spot price represents all sizes of silver but the truth is that is the price of 1,000 oz bars which is the size the COMEX holds. If the COMEX delivered 1oz coins, spot price would be higher but not much as premiums like I said have come down. So now that we established that an arbitrage move can't actually happen, what incentive is there for a paper silver holder to demand delivery of the physical metal? If you can truthfully answer that question and have that answer spread throughout, you'd catch the ears of paper silver holders and cause them to take delivery of the physical metal. Despite everything I said about paper silver VS physical silver, i still think silver is a great investment and here's why. According to CPM in 1900 the world was estimated to have 12 billion ounces of above ground silver and today there is estimated to be only 1 billion ounces of above ground silver. That is 11 billion ounce of silver gone in 110 years. That's an average of 100 million ounces per year. So if there is only 1 billion ounces of above ground silver left, 100 million in to 1 billion is 10. So we have about 10 years until above ground silver runs out. Got silver? I do. Most investments are electronic derivatives. Very few people invest in any hard assets. when the music stops there will be no chair for you ...as to the paper trade. if the crap hit the fan.......is there a chair for the paper trade??? I can't see why it shouldn't be realistic that people change the way they invest and turn to physical assets instead of paper. The problem is that people still believe in what bankers say about investments, and the banks offers GLD and SLV certifikates, not bars and bullions. Still, there is a very small percentage of the population that invest in such assets. 50 years ago, almost every person held physical silver in coins. You can check out http://coinflation.com/ for current melt value of those coins. I'm waiting for the moment when the people will demand those coins back, when they see how much they are worth compared to the nominal value and see what inflation has done to their money. @Numonic: you can see decoupling price of physical from a derivative. The premium on CEF is 13 percent, was 12 percent day ago and was not two-digit at least for several weeks, perhaps for several months. CEF is audited and is being expected to own the stuff according to periodic table. Even sharper picture provides comparison of Sprott's PHYS gold fund to GLD. There are also many reports people are converting paper gold to physical. Well, we shall see, maybe paper gold is going to crash as some predicted. Paladin, Sebastian and Stibot, I should add that when inflation gets high enough, people will stop accepting the currency. It doesn't matter how high the nominal price of silver derivatives go because people will not be accepting the currency regardless of the nominal value that the derivatives go to. Who ever does accept the currency will have to immediately trade it for something of value because the amount they get will become worthless almost as soon as they get it. Which is why people will stop accepting the currency. I think that this whole global recession is orchestrated to keep silver consumption down. Being that silver is such an important industrial metal. I think that right before the recession we were very close to seeing the extinction of above ground silver. The numbers may be even worse because some estimates say there is only 300 million ounces of above ground silver left, not 1 billion. That would mean we'd only have about 3 years left until there is no more above ground silver. This would explain the shortage of silver at the silver shops that we witnessed in 2008. Granted paper silver is thwarting investment demand for physical silver but I think the silver shortage has gotten so serious that they are also trying to thwart industrial demand and doing so by causing this recession in which businesses go under so that less products(which use silver) are produced/demanded. Unemployment and credit crunch means less money going towards silver and the products that use silver. I think that there is less demand for physical silver right now than there was before the recession(before 2008). No doubt investment demand for physical silver has increased but industrial demand for physical silver has decreased more. It seems that they are trying to slow down the consumption of silver with this global recession. The last great depression did the same by demonetizing silver causing a less demand for silver. We used to have enough silver for both money(investment) and industry, now we only have enough for industry and very soon(within 3 to 10 years) there won't even been enough for industry. They can slow the consumption of silver down but they can't stop it as it is vital to the products we need to produce necessities. I think we have 3 to 10 years left until there is no more above ground silver on the market. The math says so. And at that point the value of silver will skyrocket, and like a virus in all the products that have silver in them, the price of all those products will skyrocket too, destroying all currencies. Which is why this recession is global. I think the world central banks know what this shortage of silver means for their currency. Some nations succumb to riots by the people who wish for the govt. to help them through the recession with subsidies such as unemployment checks and health care but it's a damned if you do damned if you don't situation for the currency issuers. If they continue on with this recession yeah they will succeed in keeping prices down but they will have to answer to all the protesters who riot and protest for unemployment checks and other subsidies to help them through the recession. Some govt. 's can't face that and they succumb to giving out subsidies and pushing for increasing credit just so they don't have to face the rioting and protesting crowd. The govt. can't allow it's people to starve or it will have to face riots and protests. Thus they can only allow the money velocity to slow down so much. And they'd like to get money velocity to slow more so as to bring down consumption but the people will riot if that happens. And so it is a balancing trick all to slow consumption. But they will fail in slowing consumption because you can see that from 1900 AD to today 2010 AD the world has been consuming silver at an average rate of 100 million ounces per year(if you calculate the 12 billion ounces in 1900 to the 1 billion today) and there were many recessions and depressions within that time period and it still did not stop the consumption of silver to bring silver from 12 billion ounces in 1900 AD to 1 billion ounces today. So I think there is nothing they can do about it. Above ground silver will be extinct within the next 3 to 10 years no matter what. I am not sure that prices will skyrocket when it turns out that they sell mostly certificates without buying the commodities. Perhaps people will get scared to invest and prices will plummet. I am also not sure that the price suppresion aims at making the dollar appear strong. They may try to lower prices in order to pay less cash to the investors. Rralf read my last reply to see what will cause silver prices and prices of many things to skyrocket. Do you believe that there was 12 billion ounces of above ground silver in 1900 and only 1 billion ounces of above ground silver left today? If so you should realize what that means for silver and all things that use silver in 10 years. I am not saying that prices cannot skyrocket eventually, I am only concerned about the immediate effects of people realizing that the funds are not really buying the comodities. Rralf why concern yourself with that which you do not believe when I just gave you an alternate reason for silver prices to skyrocket. So what if the realization of the silver market being over-leveraged is not the cause for the price to rise, I just gave you a mathematically sound reason to believe the price will rise. I would never trust a piece of paper telling me I own gold or silver stashed somewhere. I would only own the physical gold and silver, preferably as jewelry. I've run around to all the yard sales in my area and have bought a lot of jewelry at fabulous prices and I always make a profit when I finally sell it. The idea of investing in these ponzi certificates makes me laugh.